Keep this door locked when not in use, mini safety sign. Mandatory instruction symbol safety sign. Use guard symbol and text safety sign. Wash your hands symbol safety sign. Bomb threat action sign. 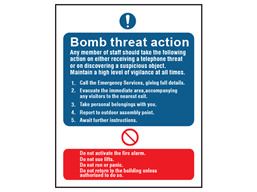 Part of our mandatory safety sign range, to advise actions to be undertaken in the event of suspicious packages, which may contain explosives, or from direct threats, to ensure public safety. General mandatory safety signs. Bomb threat action. Mandatory safety complying with IS0 1710 and the Safety Signs and Signals Regulations 1996. MS1830 Size 250mm x 200mm. Material self adhesive vinyl. MS1831 Size 250mm x 200mm. Material rigid plastic.